SOUTH COUNTY – In the end, immigration activists never made it to the site of yesterday’s planned demonstration, a plaza dubbed Friendship Park that sits on a bluff overlooking the ocean at Border Field State Park. The Department of Homeland Security announced late last year that it will prohibit all public access to the park where a secondary wall is under construction. Since then, the plaza has become a symbolic touchstone for those who debate border enforcement. Until recently, federal officials had planned to have a gate in the secondary fence that would have allowed people on either side to visit. In recent weeks, Fanestil and others formed the Friends of Friendship Park Coalition to save the park and have received support from elected officials, including Reps. Bob Filner and Susan Davis, both San Diego Democrats. Filner, Davis and other federal lawmakers from border states sent a Feb. 8 letter to President Barack Obama asking him to revisit the construction plans. Yesterday, about 125 park supporters marched the mile or so on muddy roads and along the beach to Friendship Park. A handful of people opposed to illegal immigration also were there. A phalanx of Border Patrol agents in off-road vehicles blocked access to the plaza entrance, causing demonstrators on both sides of the issue to gather below the bluff. The spot was not without poignant symbolism, a strip of beach pierced with metal pilings that form the existing border fence, which runs into the ocean for a few feet before giving way. A child could easily swim between the two countries. On the south side of the pilings, Mexican families strolled on the beach, bought roasted ears of corn from a vendor and leaned against the fence to watch happenings on the other side. On the north side of the pilings, Friendship Park supporters held an ecumenical religious service, complete with a choir. Opponents of illegal immigration tried to disrupt it with a siren-blasting bullhorn and shouted slogans such as, “Go home, illegals!” One wore a cap with the logo of the Minutemen, an anti-illegal-immigration group. Since the ban on public access to Friendship Park was declared, a few dozen immigration activists have continued to gather there weekly to hold religious services and other activities. “This is the first day they’ve chosen to enforce the ban on public access,” Fanestil said. “Before, they tolerated our presence. Clearly they will tolerate us no more.” Fanestil said he and other members of the park coalition plan to meet and discuss plans for future park actions. 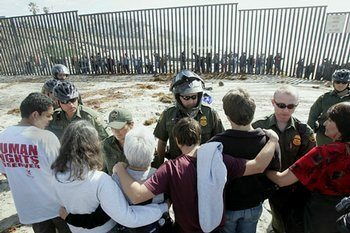 Mark Endicott, public-affairs officer for the U.S. Border Patrol, said no public access will be authorized between the primary and secondary border fences. The decision to impose the ban is “based on our border security mission and to assure the safety of border agents and the public,” he said. LAKESIDE — Jody Morgan cherishes his 100-acre property in El Monte Valley, where El Cajon Mountain rises above the rural community that’s home to a dairy and horse farms. At a Lakeside planning group meeting Wednesday night, Morgan held up a photo he created of what the valley would look like if the proposed Sunrise Powerlink transmission line were built there. Lattice steel towers more than 150 feet high held up power lines running over the land. “If this project is not a sin, it’s a crime against nature,” Morgan said. Morgan was one of about 100 people at the meeting to hear a presentation by SDG&E officials. Angry residents said they weren’t given notice that the approved route for the controversial Sunrise Powerlink transmission line will run through El Monte Valley. “I took this as a personal slap in the face that nobody bothered to contact Lakeside,” said Rick Smith, chairman of the Lakeside planning group. In December, the California Public Utilities Commission approved a 123-mile line running through East County along Interstate 8 from Imperial Valley to San Diego. The commission rejected SDG&E’s plans to run the $2 billion line through Anza-Borrego Desert State Park. SDG&E officials said numerous community meetings were held in East County while the transmission project was being considered for approval. An open house will be held Wednesday in Lakeside to answer residents’ questions. Residents said that because of SDG&E’s focus on the northern route, they had few worries that the line would be built through East County.